Jonathan Blunk’s excellent new biography, James Wright: A Life in Poetry, reintroduces the reading public to a “God-haunted” man brimful with delight in language and poetry, storming into and against self-doubt. Through nearly 200 interviews with family and friends, and many dozens of selections from Wright’s journals, letters, poems and prose, Blunk gives us a portrait of a poet America so desperately needs to listen to again. Andrew Mitchell Davenport: How were you introduced to Wright’s work and what led you to compose a biography of him? 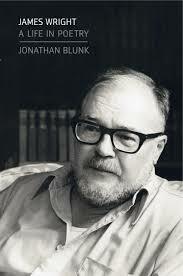 Jonathan Blunk: I had the good fortune of studying with an excellent poet-teacher at Cornell University when I was an undergraduate there in the late 1970s, while James Wright was still very much alive. My professor’s name was Thomas Johnson, and on the first day of class—both writing poems and reading contemporary poetry—he asked his students to read a poem of their own, and then he assigned each of us a book to read before the next class. I had never read Wright’s work, but after hearing my poem Johnson sent me to the library to find The Branch Will Not Break. He was listening for a sympathetic spirit, and a challenging one, who could help expand what we were doing in our own writing. Like so many readers, I responded immediately to Wright’s poems. I soon began writing an honors thesis on Wright’s translations from the Spanish of Pablo Neruda and César Vallejo, fascinated by the effect this work had had upon his own poetry. I met Robert Bly in June 1979, and he encouraged me to seek out Wright when he returned to New York City after a long sojourn in Europe. But Wright’s illness and sudden death prevented me from interviewing him. That sense of lost opportunity is somehow behind my decades-long pursuit of Wright. After producing other radio documentaries in the 1980s, I began work on an audio portrait of Wright when his Complete Poems, Above the River, was published in 1990. My first interviews with Bly and with Anne Wright date from this time, along with many others. In 1998, after visiting with Anne and learning that the biographer she had contracted with had spent more than fifteen years without any sign of progress, I decided to pursue more interviews, worried that many of Wright’s family members and colleagues were aging. All my research is my own; Anne asked me to write the authorized biography in 2002. Did you discover how Wright went about composing and editing his poetry and prose? Wright carried a 4-inch-by-6-inch notebook in which he was constantly jotting down lines, impressions, and ideas for poems “on the fly,” as Anne Wright described it. These battered notebooks were held together by rubber bands, and when he took one out of his pocket he rolled the bands onto his wrist while he was writing, then replaced them onto the notebook. Anne grew accustomed to seeing the marks that the rubber bands left on his wrist. The most fascinating aspect of Wright’s editing process in the last decade of his life was how he alternated between line-break versions of his poems and drafts in prose. He would often type out a poem in prose to “hear” what it sounded like; just as often, he would then rework the same piece in verse. The prose piece “May Morning” from This Journey is, in fact, a near-perfect Petrarchan sonnet. Throughout his life, Wright would draft new versions of poems without referring to his previous attempts, beginning again from scratch. “At the Executed Murderer’s Grave” is an excellent example of this. Would you describe the process of tracking down Wright’s letters for your edited collection of his correspondence? I sought out archives where significant correspondents of Wright’s have their papers, such as Theodore Roethke’s collection at the University of Washington, Seattle. In the late 1960s, Wright began to keep carbon copies of his own letters, which helped Anne Wright and Saundra Maley assemble the bulk of the Selected Letters, A Wild Perfection. Most significantly for the biography, I was able to secure a previously unknown collection of letters that a former student of Wright’s had preserved from a period of about two years, from 1957 through 1959. Wright referred to these “letters to Jenny” as a kind of journal, and their openness and intimacy contributed greatly to the texture of my book. Wright’s life seems a series of consolations and desolations. Which texts helped him through the more trying episodes in his life? I believe that Robert Bly was correct in calling Wright “God-haunted,” because he was consistently drawn to the work of theologians and mystics. The absence of God, or his inability to accept the presence of God on faith, troubled Wright. He often returned to the writings of Jakob Boehme, Meister Eckhart, and Juan Ramón Jiménez as sources of solace. The breadth of his reading in world religions and poetry was astonishing. Wright constantly praised The Revolt of the Masses by José Ortega y Gasset and The Tragic Sense of Life by Miguel de Unamuno; he assigned these books to his students and reread them frequently. The writer he returned to more often than any other was George Orwell, for the clarity of his prose and his strong moral vision. What led Wright to pursue journal writing and prose in his later years? Wright would have argued that it was simply about time he tried writing good, clear prose. David Wagoner wondered why he hadn’t tried his hand at prose much earlier. It’s important to honor Wright’s distinction that he was not writing “prose poems,” but rather “prose pieces.” His journal writing became a source of strength for him, like keeping a promise to himself. In this way, he turned his daily work in his journal into a means to keep sober and to make deliberate, steady progress with his writing. Wright considered teaching even more of an art than poetry. Would you describe the courses he taught over the years? Wright maintained an honest humility about his own poetry, in large measure because he considered himself to be part of a centuries-old tradition of poetry, in which Catullus, Horace, Po Chü-i, Ben Jonson, Theodore Roethke and many others were the true masters. Teaching was something Wright took real pride in, and his constant contact with students and with the books and authors he loved helped him keep his balance. The courses he loved to teach most were an advanced course on the novels of Dickens and a course on comic writers, such as Fielding, Swift, Sterne, as well as more contemporary writers—Mark Twain, Ring Lardner, Flannery O’Connor, and others. The book he assigned more often than any other was undoubtedly Cervantes’ Don Quixote. Through his teaching, Wright influenced a generation of American students. Would you describe their recollections of him? Would you describe some of his students who achieved prominence? I think the most prominent example is the poet and novelist Donna Masini, who studied with Wright at Hunter College and is now a Professor of English there. The wonderful Minnesota poet Freya Manfred was a student of Wright’s at Macalester College in the mid-1960s, and the poets Jeanne Foster and Joel Lipman began working with Wright at the University of Buffalo in the summer of 1974. All of these fine writers have also won acclaim for their teaching. What was it like to read from your book in Gambier, Ohio, at Kenyon, where Wright attended college? I enjoyed returning to Kenyon College, where the faculty and students gave me a warm reception. It had been more than a decade since I’d last been on campus doing research in the library and wandering the halls of the classrooms and dorm buildings. I believe in the strategy advocated by the great Romantic biographer Richard Holmes, who insists that biographers must follow in the footsteps of their subjects, to try to see and feel what they would have seen and felt, through an act of sympathetic imagination. In my biography of Wright, I’ve tried to give readers strong, vivid glimpses of the poet in all the places he lived and traveled to in his sadly shortened but very full life.